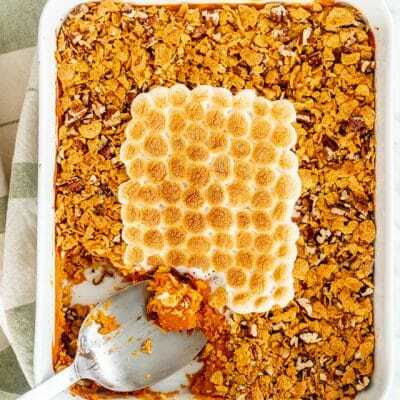 This Sweet Potato Casserole is a classic Thanksgiving casserole with a crispy cornflake and pecan topping and marshmallows. Sweet, crispy and delicious! A must have on your Thanksgiving table! 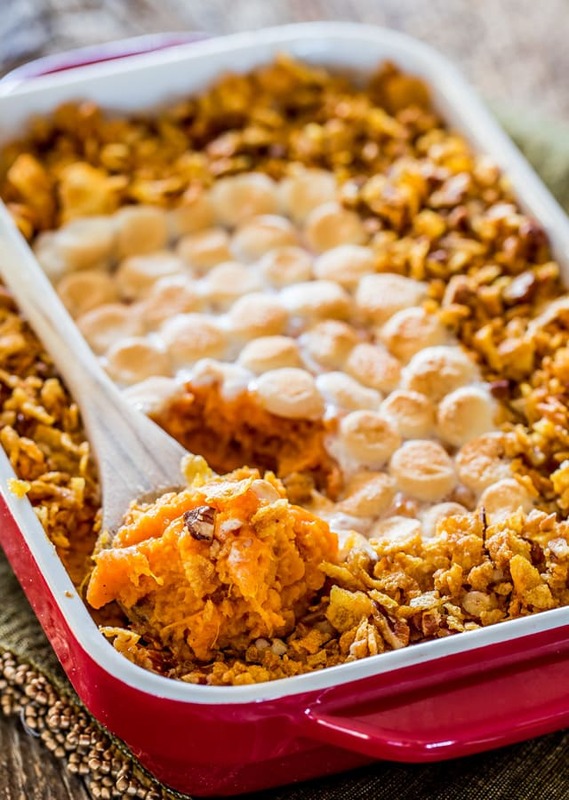 What’s not to love about a sweet potato casserole? It’s sweet and delicious with a crispy cornflake and pecan topping and more importantly it has marshmallows. Sounds like a kid’s dream come true kind of side dish. But you don’t have to be a kid to enjoy this, it’s for adults too! It really is a must have side dish on your Thanksgiving table, right there next to your favorite stuffing recipe. We’re talking vegetables in a creamy, sweet and decadent way! The star ingredient is the sweet potato, but the great thing of this casserole is that you only require a handful of ingredients, and chances are you have them in your fridge or pantry. You’ll need some brown sugar for extra sweetness, an egg, milk and butter to make it extra creamy, a bit cinnamon and a pinch of salt to bring all the flavors together. I love to add a crunchy topping to my casserole; cornflakes, pecans, brown sugar and a bit of butter. In my opinion this crunchiness makes all the difference. Of course, let’s not forget the marshmallows. I love to use the mini ones because they’re super cute, but the large ones work as well. There are multiple ways to cook your sweet potatoes. First of all you should clean the sweet potatoes, scrub them then pat them dry. MICROWAVE: Pierce the potatoes with a fork 5 or 6 times then place them on a microwave-safe plate and microwave for 5 to 10 min per potato. Add 2 minutes for each additional potato. Make sure to rotate them halfway through. Sweet potatoes are cooked when a fork spears into them easily. If you feel they are too firm, continue cooking them in one-minute increments. BOIL: Peel and cut up the sweet potatoes in cubes and add them to a large pot of boiling water. Cook them over medium-high heat for about 20 minutes. BAKE: Preheat your oven to 375 F degrees. Line a baking sheet with aluminum foil then rub each potato with some vegetable oil. Prick the potatoes 5 or 6 times with a fork, then place them on the baking sheet. Depending on the size of your sweet potatoes it can take anywhere from 30 minutes to 1 hour until they’re done. 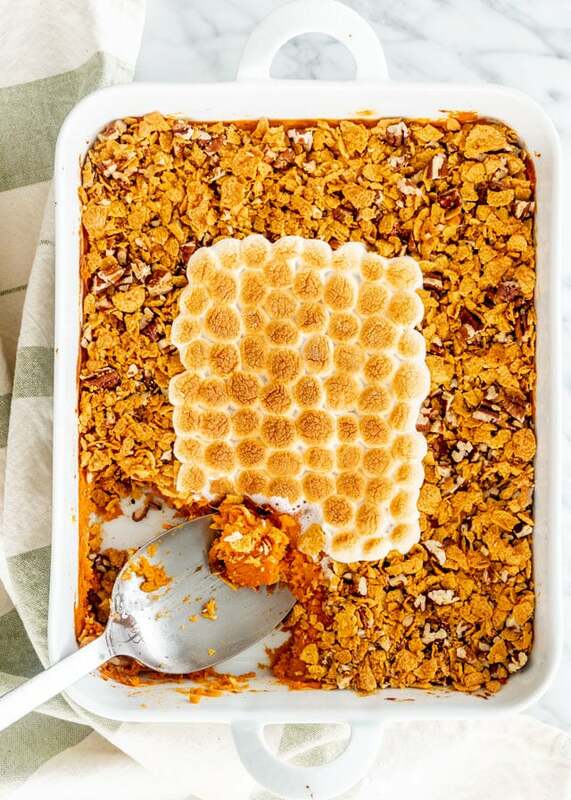 The great thing about this sweet potato casserole is that it can be made ahead of time. Prepare it just as instructed in the recipe but leave out the cornflake topping and marshmallows. Let it cool completely then cover it up with aluminum foil and refrigerate for up to 3 days. Before serving top it with the cornflake topping and marshmallows and bake as instructed. Preheat oven to 350 F degrees. Grease a 9x13-inch baking dish and set aside. Add the sweet potatoes, brown sugar, butter, cinnamon, vanilla extract, milk, egg and salt to a large bowl and mash with a potato masher. You can use a hand mixer as well if you wish. 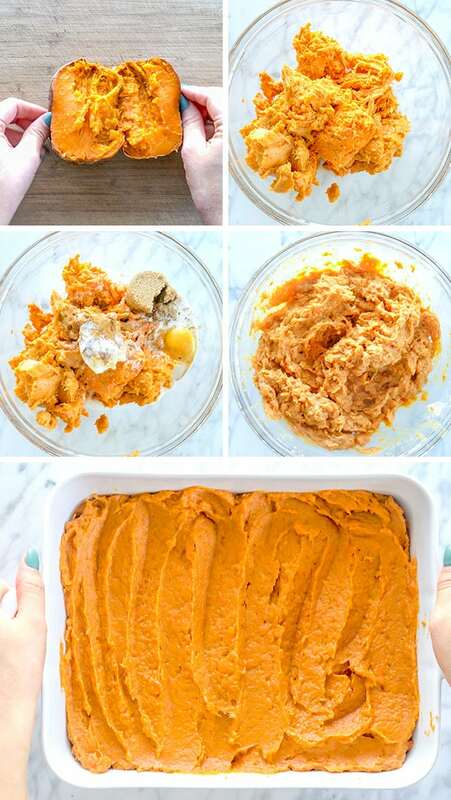 Spread the mashed sweet potatoes in the prepared casserole dish and bake for 30 minutes. While the casserole is baking, add the cornflakes, pecans, butter and brown sugar to a medium size bowl and toss everything together. Top with marshmallows in the center of the casserole, then sprinkle the cornflake mixture around the marshmallows. Place the dish back in the oven and bake for another 10 minutes or until the marshmallows are puffed and golden brown. Originally shared Nov, 2015. Updated with additional information, new pictures and video. 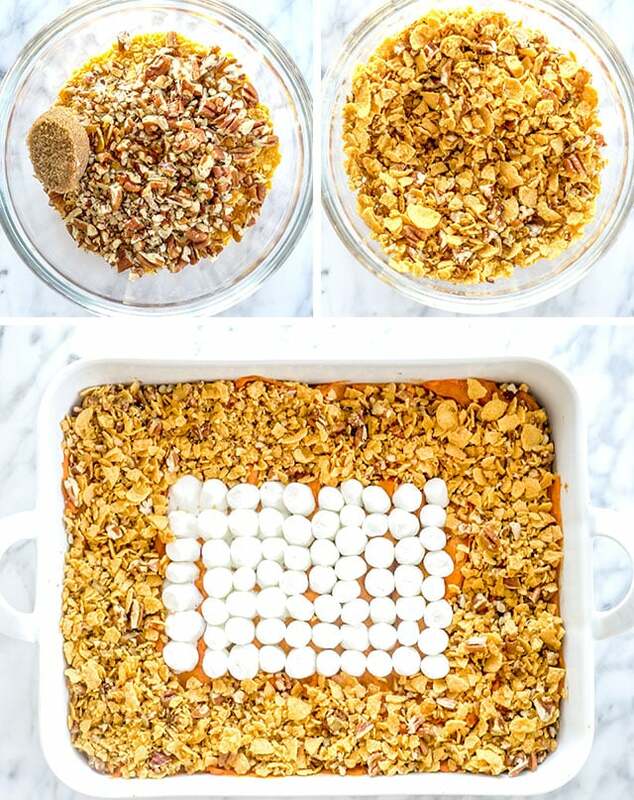 This is the best sweet potato casserole! We LOVE it. I double the topping because it’s so yummy 🙂 it’s a perfect compliment for our Thanksgiving and Christmas meals!!! For the young woman that is allergic to egg. I am 80 and from the south we have never added an egg to our sweet potatoes, we add butter in place of margarine as margarine has additives to it. Believe it or not butter is healthier for you than margarine, pecans are delicious in the potatoes and I am diabetic so I use the Splenda Brown Sugar Mix. We’ve never added dry cereal for the crunch, because of the nuts. In place of milk we add about 1/4 cup of bourbon. The alcohol cooks out of the sweet potatoes and it gives a delicious flavor to the potatoes, I use marshmallows on mine but leave a small portion marshmallow free for me due to my diabetes.